Call-In Today: Drop the Charges on Durham Arrestees and Repeal Racist Law Take Action! 1. Call Durham County DA Roger Echols at 919-808-3010 to drop all charges against the Durham anti-racist activists for the events in Durham related to the toppling of the Confederate statue. Show solidarity with the growing people’s movement that is challenging the racism that allows public monuments to white supremacist ideals and values in the form of Confederate statues to stand in our communities. On August 14, Durham residents took down the supremacist Confederate soldier statue in front of the Durham Courthouse. This occurred just two days after Nazi’s and KKK rallied in a “Unite the Right” rally in Charlottesville, VA to defend Confederate statues and killed an anti-racist protester, Heather Heyer. 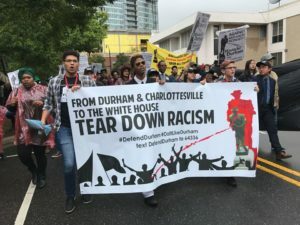 The Durham action was another powerful expression of people’s anger and disgust with how the system uses its power to remind Black, Brown and oppressed people of their “place” and ongoing oppression and exploitation. After Heather Heyer’s murder by white supremacists in Charlottesville in August, Conferderate flag sales quadrupled. In Durham, people took the Confederate monument down themselves – demonstrating that many feel they should take matters into their own hands when governments attempt to stop progressive social change. In 2015, the Republican-dominated NC State Legislature passed a bill that took away authority from local city and county governments to remove Confederate statues from their property, GS § 100-2.1. This is the same state Legislature that the US Supreme Court ruled gerrymandered voting districts based on race with “laser-like precision”. The state Legislature also passed similar legislation – HB2 — that eliminated local governments’ power to protect trans-gendered people from hate crimes, or enact protections for workers from abusive employers, like raising the minimum wage and improving working conditions for contractors. #ISupportRemoval #DoItLikeDurham #DroptheCharges against anyone charged with removing the Durham Confederate statue! 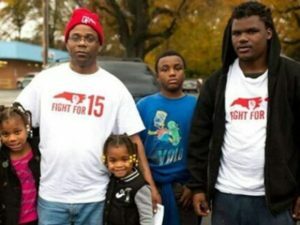 Nov 14 (9am court hearing, 10:30am press conference), Nov 16, and Dec 5 at the Durham County Courthouse 8:30-10 am! DONATE TODAY to Fight for Justice for Abdul Burnette and all Durham County Jail Inmates! Abdul Burnette, 20 years old was arrested on September 23 for three misdemeanor charges. Yet he was given a $10,000 bond, typical of felony charges. His father, also named Abdul, a leading fast food worker in the local Fight For $15 movement, attempted to post bond but was not allowed to bond him out. This is why we demand ABOLISH BOND! Before being convicted of any crime, a judge sentenced him to a 60-day “Starr and Grad” drug rehab program inside the jail. This is why demand END CRIMINALIZATION OF PETTY MARIJUANA POSSESSION! Earlier this year, on April 24 young Abdul was also assaulted by a Durham police officer, Officer Offenburg, on the corner of Fleetwood St. and S. Alston St. in east Durham. His father has filed a complaint with internal affairs of the Durham Police Department and it is still under investigation. This is why we demand END RACIAL PROFILING AND POLICE BRUTALITY! “The Durham County jail is violating my son’s constitutional rights. We are going to keep fighting until we get justice!” stated Abdul Burnette, the father. This same jail is scheduled to begin video visitation this week (Oct. 15) for families of those locked up, denying them basic right to visit their loved ones in-person, rather they will be forced to only communicate through a screen ran by a private corporation. This is why we demand FULL IN-PERSON VISITATIONS! This past weekend, young Abdul was being picked on and attacked by another inmate. In his self-defense he fought back. He is now placed on “lock-back” solitary confinement for the next 30 days and all family visitations have been cut-off. This is why we demand END LOCK-BACK and SOLITARY CONFINEMENT! This is happening amidst many local struggles in the Durham County Jail including five deaths of inmates in recent years, including the death on March 23, 2017 of 17-year-old Uniece “Niecey” Fennel. This is why we demand NO MORE JAIL DEATHS! End Criminalization of marijuana possession! Full access to affordable healthcare for all inmates! End the contracts with the abusive, exploitative corporations! End racial profiling and police brutality! Sept 12 – Topple White Supremacy: Pack the Courts & the Streets! September 12 is the next court date for some of the anti-racist freedom fighters arrested in connection with the toppling of the Confederate statue that once stood in Durham. Show up in Durham to demonstrate our continued support for them and keep pushing forward the struggle to tear down white supremacy! We will also honor the resistance in Charlottesville, VA on the one month anniversary of the murder of Heather Heyer, and the struggle across the South to tear down the vestiges of the Confederacy and white supremacy – from monuments, to the school to prison pipeline, police brutality, the prison industrial complex, and more. Communities and organizers from Charlottesville to Durham have shown that now, more than ever, is the time to take bold and courageous action — to pick either the side of white supremacy or the side of freedom fighters who dare to envision a different and better world for us all. Join us in Durham to take the side of freedom! 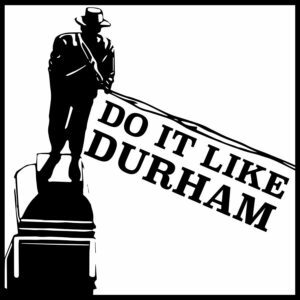 Also, get limited edition, commemorative Do it like Durham tshirts and hats! El Comité de Acción Popular en coordinación con otros grupos de base hace un llamado a la comunidad y a los afectados por la decisión de suspender DACA a manifestarse y juntos tomar acción para que esta acción ejecutiva sea devuelta a nuestros jóvenes. The Comite de Accion Popular, in coordination with other grassroots groups, calls on the community and those affected by the decision to suspend DACA to show out and take action against this attempt to deport our youth! Congratulations on making history, Durham! The Durham Solidarity Center stands in solidarity with Charlottesville and those who took down the Durham Confederate Statue. We congratulate the people of Durham for their victory in tearing down one of the more visible manifestations of white supremacy. On August 14, 2017, in the aftermath of a weekend of white supremacist terrorism unleashed in Charlottesville, the community of Durham united to express their solidarity with the people of Charlottesville, and honor those who were injured or lost their lives standing against racism. The Durham community then took matters into their own hands, tearing down the Confederate monument outside the old Durham County Court House. The Durham Solidarity Center supports the right of Durham and all people to tear down symbols of hate! Onwards in the fight to tear them all down and fight back against white supremacy! For many of us fighting the ravages of the prison industrial complex, George Jackson is a source of inspiration and discipline. Over forty years ago, George Jackson pleaded: Settle your quarrels, come together, understand the reality of our situation, understand that fascism is already here, that people are dying who could be saved, that generations more will die or live poor butchered half-lives if you fail to act. Do what must be done, discover your humanity and your love of Revolution. Pass on the torch. Join us, give your life for the people. On August 21,1971, Jackson was assassinated by guards at San Quentin Prison during a prison rebellion. The month of August bursts at the seams with histories of Black resistance–from the Haitian Revolution to the Nat Turner Rebellion, from the Fugitive Slave Law Convention and the foundation of the Underground Railroad to the Brotherhood of Sleeping Car Porters, from the March on Washington to the Watts Uprising, from the births of Marcus Garvey, Russell Maroon Shoatz, and Fred Hampton to the deaths of W.E.B du Bois and George Jackson’s own younger brother Jonathan killed while attempting to free the Soledad Brothers from prison. We celebrate Black August, commemorating the anniversary of George Jackson’s death while understanding his life as a revolutionary in a long and unbroken line of resistance and sacrifice of Black people throughout history. Black Families, Black Food, Black Music. Black Community, Black Movements, Black Liberation. Come celebrate and commemorate Black August with us at Durham Central Park. We will have music, activities for the whole familiy, feature organizations doing local, regional and national work to get us free. Black August in the Park is a space created specifically for people of the African Diaspora–their joy and healing. Whatever your Black looks like we want you to bring it to our space and be free!